Located on a limestone plateau with provencal vegetation, the Grads de Perret are at the entrance of a natural park Natura 2000. 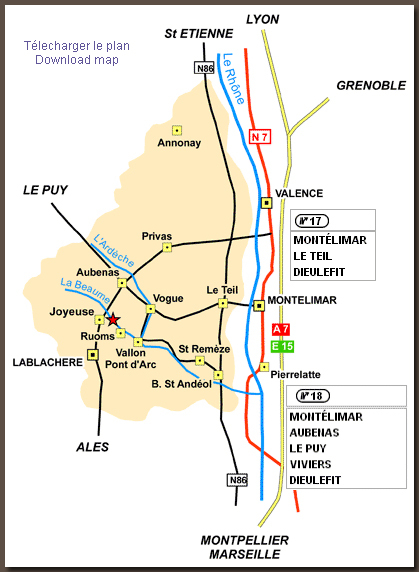 We are 25 km from Aubenas, 20 km from Vallon Pont d'Arc, 17 km from Vans and 3 km of Joyeuse (medieval town). We enjoy a beautiful view and are at the crossroads of four rivers: Beaume, Ardeche, Chassezac and Drobie! Between ROSIERES and JOYEUSE arrived at the roundabout (Carrefour petrol station, Gamm Vert), do not enter into Joyeuse and go straight towards ALES. Ride 250m and turn left towards "GRAS", a small stone bridge to "The Freyssinet." Follow 2km approx. on a narrow, winding scenic route. On arrival on the set of the Grads, at 290m of altitude, you descend on your left about 250m, "Le Mas des Grads de Perret" will be on your left (existing panel) .